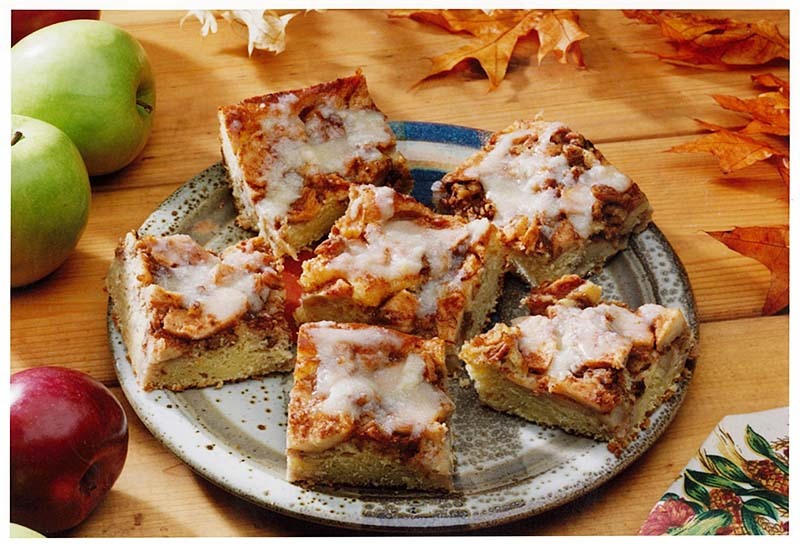 Warm butter sauce served over coffeecake lends the right touch to this apple-topped kuchen. Melted butter blended into the topping enhances the keeping quality of the sliced apples. Have liquid ingredients at 80ºF and all others at room temperature. Place ingredients in pan in the order listed. Select dough/manual cycle. Do not use the delay timer. After 5 minutes of kneading, open lid of bread machine. Scrape sides of bread pan with rubber spatula, moving the soft batter towards kneading blade to assist mixing. Do not add additional flour. When cycle is complete, remove batter and follow directions under the Shaping, Rising and Baking section below. See our Bread Machine section for more helpful tips and information. Dry mixture: Combine 1¾ cup flour, salt, sugar and yeast; set aside. Liquids: Combine water, milk and butter; heat to 120-130ºF (butter does not need to melt). Hand-Held Mixer Method: Combine dry mixture and warmed liquid ingredients in mixing bowl. Add eggs; blend at low speed until moistened; beat 3 minutes at medium speed. By hand, gradually stir in remaining flour to make a soft batter. Place dough in lightly oiled bowl and turn to grease top. Cover; let rise in warm place until double, about 30 minutes. Standard Mixer Method: Combine dry mixture and warmed liquid ingredients in mixing bowl. Add eggs; blend at low speed until moistened; beat 3 minutes at medium speed. By had, gradually stir in remaining flour to make a soft batter. Place dough in lightly oiled bowl and turn to grease top. Cover; let rise in warm place until double, about 30 minutes. Have all ingredients at room temperature. Put 1¾ cups flour, yeast, salt and sugar in processing bowl with steel blade. While motor is running, add butter, eggs, milk and water. Process until mixed. Continue processing, adding remaining flour until a soft batter forms. Place dough in lightly oiled bowl and turn to grease top. Cover; let rise in warm place until double, about 30 minutes. Prepare Topping: In medium bowl, combine all topping ingredients. Set aside. Stir batter down. Spread in greased 13x9-inch cake pan. Spoon Topping over batter. Cover, let rest for 10 minutes. Bake in preheated 350ºF oven for 45 to 50 minutes until golden brown. Prepare Butter sauce: Combine sugar, butter and half-and-half cream in pot. Heat to boiling, simmer until thickened, stirring occasionally. Add vanilla. Stir to combine. Serve warm, with butter sauce drizzled over top. *You can substitute Instant (fast-rising) Yeast in place of Active Dry Yeast in batter/no knead recipes. When using Instant Yeast, expect your batter/dough to rise about 50% faster. Adjust your rise times accordingly. Traditional methods: use equal amounts; Bread Machine: use ½ tsp Instant Yeast OR ¾ tsp Active Dry Yeast per cup of flour in your recipe. Visit our Lessons in Yeast & Baking for more information. i would love to make this recipe with Kitchen Aid Mixer, yummy recipe and great tools, how wonderful life..